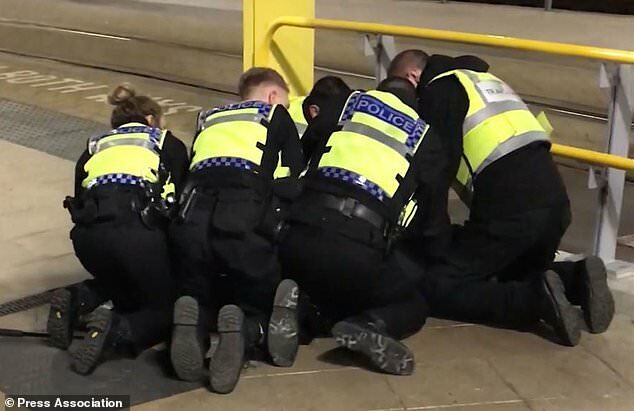 British Transport Police officers are facing more than 12 attacks a week, it has emerged, just hours after one of them was stabbed at Manchester Victoria station. There were 1,939 reported assaults against British Transport Police (BTP) officers in the three years to October 2018, resulting in more than 230 injuries, Freedom of Information requests have shown. Leeds station in West Yorkshire had the greatest number of assaults, with 66 incidents between 2015 and 2018. London Victoria came second, with 60, closely followed by Manchester Piccadilly with 56 attacks in the last three years, the force said. The figures included 17 assaults at Manchester Victoria station, where a BTP officer was stabbed in the shoulder on New Year's Eve. He has since been released from hospital. There were several London stations near the top of the list, with 48 assaults at Stratford and 44 at St Pancras International. London terminuses Euston, Waterloo and Liverpool Street stations saw 43, 42, and 39 incidents respectively. Glasgow Central station saw the most assaults of any station outside England with 38.